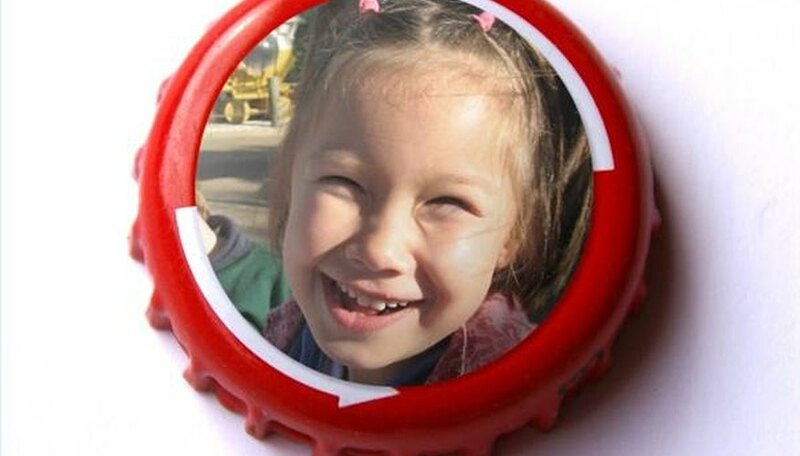 Putting your own pictures on the smooth front of bottle caps is a popular, simple craft project that is suitable for children. The bottle caps can be punched to use as personalized key chains, necklaces or earrings or backed with magnets for use on refrigerators or message boards. Wash the bottle caps with warm, soapy water and then let them dry completely. Using scissors, cut the photo images into circles just smaller than the rounded top of a bottle cap. Put a small smear of glue stick on the back of the cut-out image then center and affix it to the front of the bottle cap. Using the clean brush, coat the image and front of the bottle cap with clear art glaze. Let dry thoroughly, approximately 12 to 24 hours, before handling. If needed, apply an additional coat of clear art glaze to seal the image to the bottle cap. For best results use intact or unbent bottle caps. Unused bottle caps can be purchased at craft and art supply stores. Check the crimped edges of the bottle caps for sharp corners or other possible hazards.